To complete the experience, Hertz worked with British artist Lauren Baker to develop a new neon light installation to launch The British Collection, signifying the union of modern and premium brands from the U.K.
Hertz Europe is launching The British Collection in the U.K., offering a new high-end customer service experience, with a package of "Best-of-British" services and products. 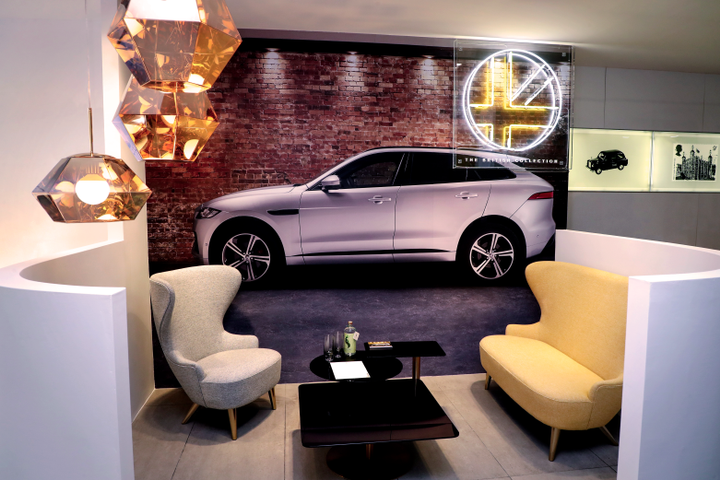 The new premium collection features Land Rover and Jaguar luxury cars for rental, British-themed lounges, and a suite of extras — including pick-up options, additional driver, and unlimited mileage to enhance the experience. The British Collection is designed to offer an end-to-end premium service, bringing together The Best of British with a host of extras included — to pamper customers and smooth the journey. Models available for hire include the Land Rover Discovery Sport and the Jaguar F Pace, E Pace, XE, and XF, from the Hertz locations at London Heathrow Airport, Marble Arch, and Edinburgh Airport. For added convenience, airport terminal delivery and collection is also part of the package for Heathrow and Edinburgh rentals — and local pick up and drop off for Marble Arch. The three locations will offer a dedicated lounge for a premium experience. Hertz has also commissioned premier London Florist, McQueens, to curate a unique in-lounge garden experience, featuring a selection of plants and flowers from across the U.K., to recreate the feel of a classic British country garden. To complete the experience, Hertz worked with British artist Lauren Baker to develop a new neon light installation to launch The British Collection, signifying the union of modern and premium brands from the U.K.